Okay - I have restrained myself from buying these cups for well over a few months... but then yesterday I couldn't restrain myself any longer. They remind me of paper coffee cups - but are not paper of course. Even Symon agrees that they make the coffee or hot chocolate (with marshmallows and grated chocolate on top) taste even better. Coolness! Where'd you find them? I am reluctant to buy anymore cups because I have no more room for them all! Believe it or not - The Warehouse. They have this special selection of cups and things in a different part - must be the flash stuff. My kids keep breaking my cups so a great excuse to buy more! oh I agree - I love special cups! 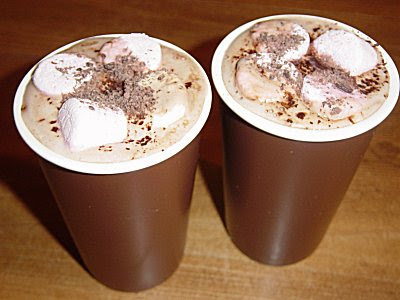 Oh my - I'm now off to make myself some hot chocolate. Hope it tastes as good as these look! !